If you’re wondering what to do in Lyon, search no more. Follow this itinerary (at least the good bits) and you’ll get a great overview of the city. Bonus: With Air Canada launching direct flights from Montreal to Lyon this June, it’s easier than ever to get there. Sadly, Mark was too busy shaking his head and grinning to listen to my reasoning. But I had to admit he was right. 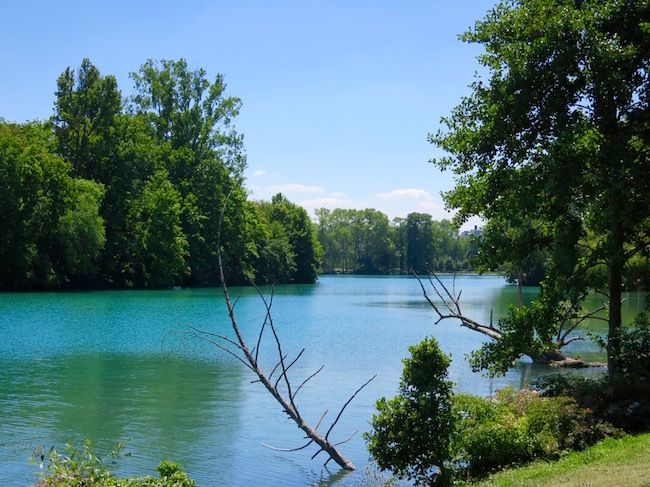 If you see a group of teenagers in the Parc de la Tête d’Or – the largest park in Lyon, France, it may be wise to take a detour. Food may be the biggest draw for visitors in France’s second largest city (or third, depending on who shouts louder, Marseille or Lyon), but there are plenty of other things to do in Lyon. (And if you’re keen to try the cuisine, read my food in Lyon article). What to do in Lyon outdoors: That’s an easy one. 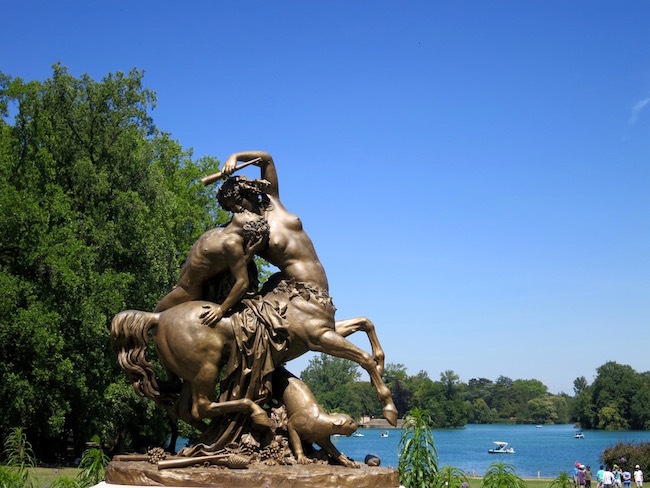 The Parc de la Tête d’Or, or ‘Golden Head Park’ is one of Lyon’s most tranquil outdoorsy attractions. This large Lyon park opened in 1856, but the legend that a golden head of Christ was buried here goes back much further. And while finding a gleaming golden head would be the discovery of the century, if all you do is walk around peering hopefully at the ground, you’ll miss out on the park’s other attractions such as the lake, rose garden, tropical greenhouses, zoological park, statues and, of course, the requisite stately trees. What to do in Lyon, culture-wise: Since you’re up at the Parc de la Tête d’Or anyway, make a stop at the adjacent Musée d’Art Contemporain de Lyon. Dedicated to temporary exhibitions, it’s a great way to tap into the modern vibe of Lyon. 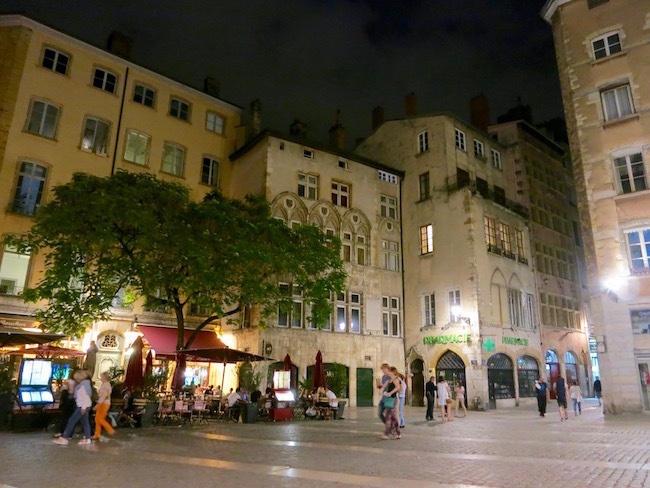 If you’re wondering what to do in Lyon history-wise, head to the medieval Old Town of Lyon. 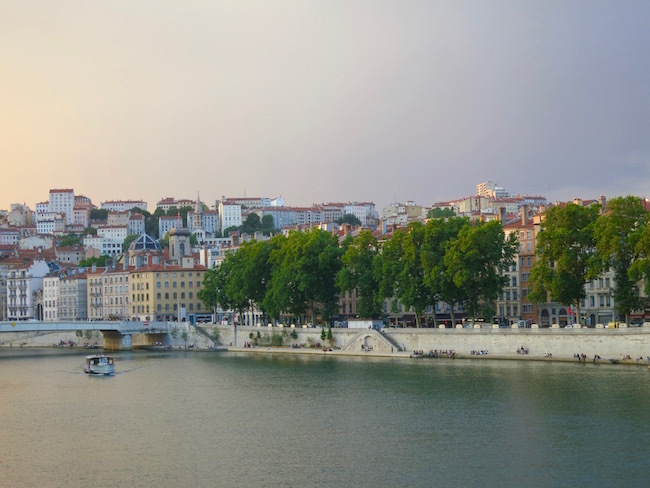 Located on the right bank of the River Saône, Vieux Lyon is a wonderful twist of of cobblestone lanes, Gothic and Renaissance architecture (don’t miss the 15th-century Cathedral Saint Jean Baptiste), ice cream shops and lively restaurants. Honestly, exploring traboules are one of the most fun things to do in Lyon. What’s a traboule, you ask? 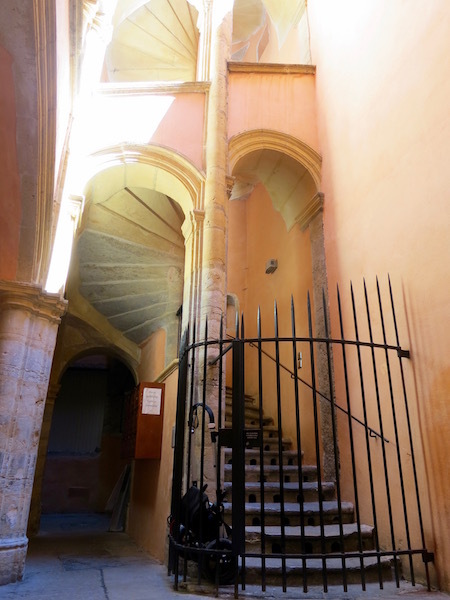 It’s a shortcut, like a secret narrow passage (which really isn’t all that secret because you can get a brochure about traboules at the tourist office) that cuts through various buildings in old Lyon and in Croix-Rousse, the historic silk weavers’ neighbourhood. Where are the traboules in Lyon? The longest traboule in Lyon runs between 54 Rue Saint-Jean and 27 Rue du Boeuf, and cuts through three courtyards and four buildings. There’s another winding one at 9 Place Colbert. Altogether there are hundreds of traboules, though many are closed to the public. 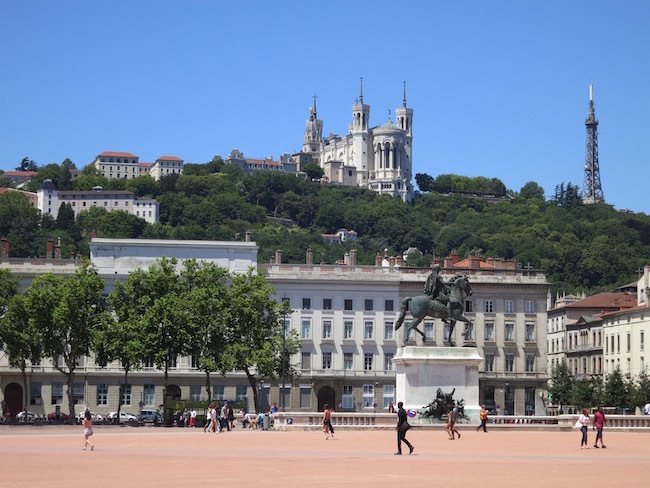 Quick history lesson: Lyon was a major centre for the silk trade. Traboules gave silk workers, also known as canuts, quick and easy passage to the town wells. Why they had to be ‘secret’ I’m not sure, and I guess they’re not really, but you’d never see them if you didn’t know they were there, and I’m sure they came in handy when the underpaid canuts staged large scale revolts in the 1830s. The Canut Revolts were brutally suppressed, with thousands of arrests and hundreds of deaths, but their motto “live free working or die fighting” inspired other workers for years to come. From the Old Town of Lyon (or anywhere else in the city) you can hardly miss the large hill looming overhead. 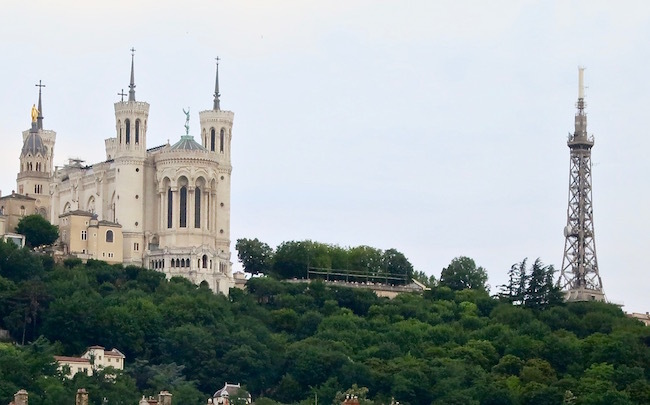 This is Fourvière Hill, the ‘Praying Hill,’ so called because of the mammoth basilica that sits on top of it. Back in 43 BCE, Fourvière was the Roman settlement of Lugdunum. 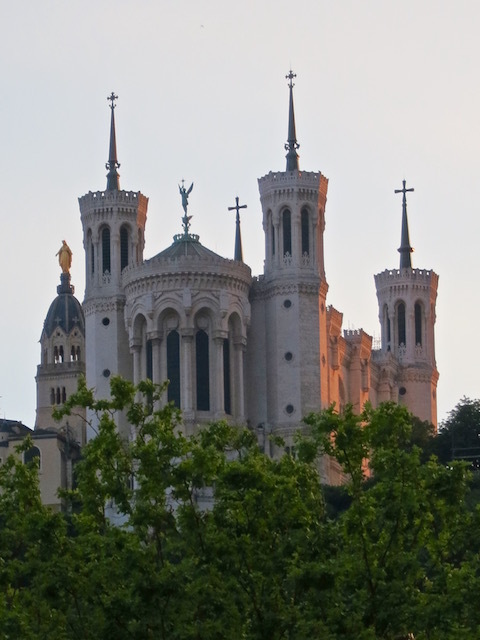 The mighty (and mighty impressive) Basilica Notre-Dame de Fourvière built in the 1800s, was erected over the site of the old Roman forum. While you’re up on Fourvière Hill, in addition to Roman ruins and the basilica, you may notice the Eiffel Tower. Only in Lyon it’s called the Tour Métallique de Fourvière, the Metallic Tower of Fourvière, and was built three years after the real Eiffel Tower. It’s the Eiffel Tower of Lyon! 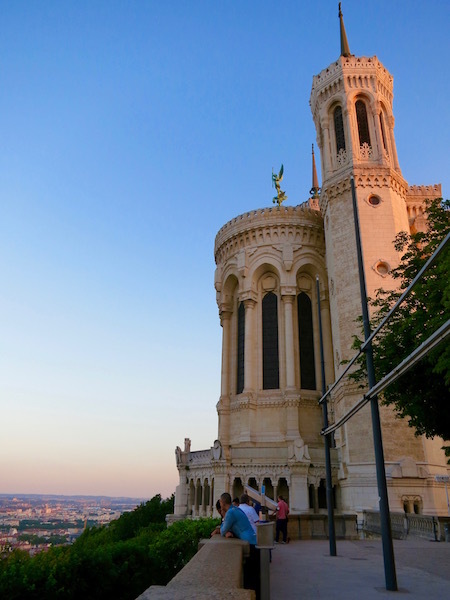 What to do in Lyon romance-wise: You can get up Fourvière Hill by funicular, which is, of course, ever so enjoyable, but if you’re looking for active things to do in Lyon I highly recommend you walk down, especially at sunset, because the path is lovely and romantic. It’s while walking down Fourvière Hill that I learned my husband is attractive. (I mean, obviously I suspected it before, but I thought it might have been just my opinion.) I learned he was attractive because an American girl kept giving him the eye all the way down the hill (until I finally managed to lose her). After that incident I kept an eagle eye out, and to my great indignation I noticed that many women in Lyon were giving my husband the whole double glance thing. As you can imagine, once I pointed it out my husband began to really like Lyon. 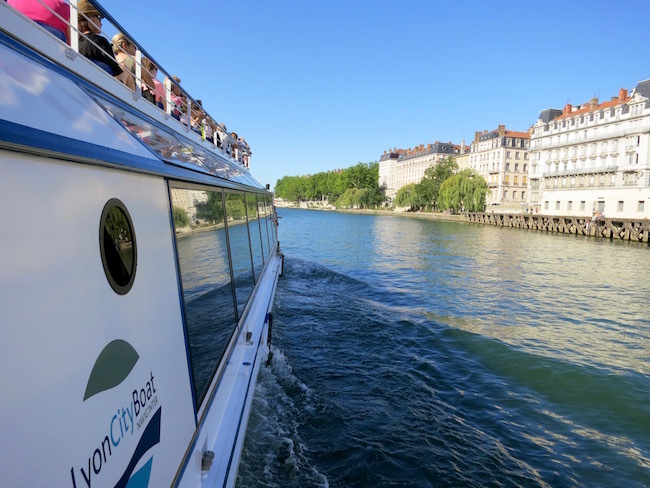 Depending on who you ask, taking a river cruise can be a delightful way to explore Lyon or the worst tourist outing ever. So listen and learn. 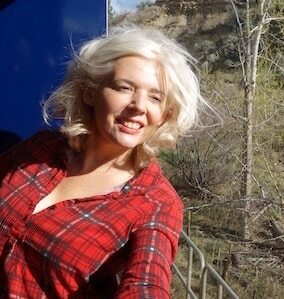 It was a brilliantly sunny day when Mark and I boarded the boat, and seats were filling up fast. I didn’t see two seats together so I grabbed an aisle seat near the front of the boat and motioned frantically at Mark to take the opposite aisle seat one row behind. To this day Mark swears he didn’t bypass the seat just because I told him to sit there. Whatever his reasoning he waltzed on by and I lost him in the crush of sightseers. As the boat sailed off I was able to catch the fresh breeze from the open door at the front of the boat, listen to the commentary and hop up to go to the outside deck at the back of the boat. Then I saw my husband. He was squished into a window seat, unable to get out because of the two older (and quite large) women with walkers who had completely wedged him in. 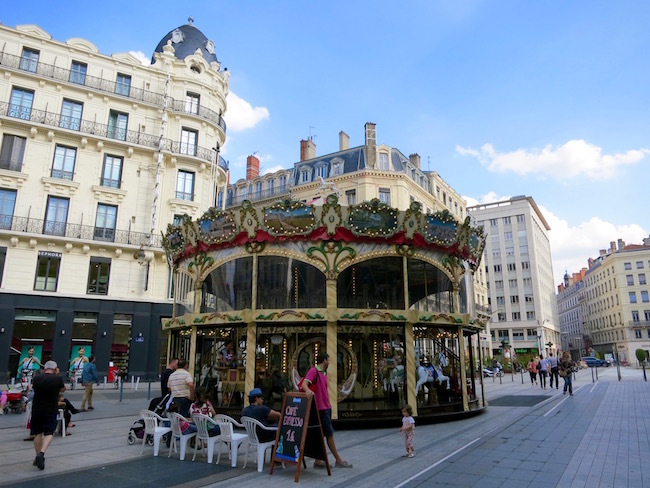 First, visit the Lyon Tourism Office on the southeast corner of Place Bellecour. Mark and I rented headsets with an audioguide there, which we then had to return, which was a bit of a pain but the headsets are great way to get a tour at your own pace. We are too a happy couple! 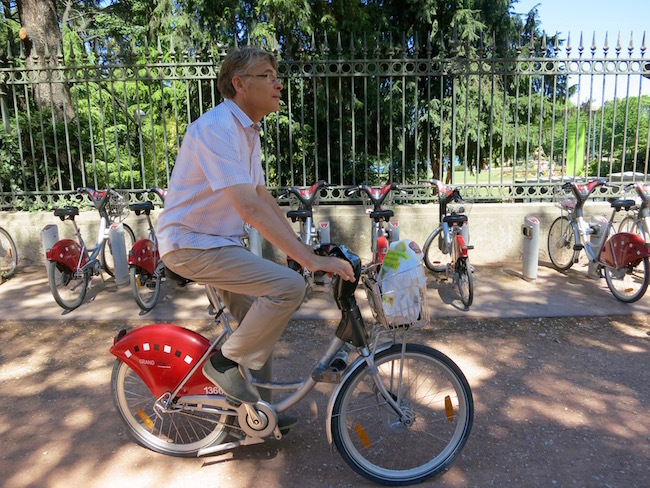 How to rent a bike in Lyon: We rented Velos. They’re cheap, handy and a great way to explore (until you panic because you’re tired and there’s too much traffic and you can’t find a station to return the bike to so your husband has to forge ahead, find the station, return his bike then come back to get yours. PS: That only happened once.) You can buy either a 1-day ticket or a 7-day ticket. The Museum of Contemporary Art of Lyon is located at Cité Internationale; 81, quai Charles de Gaulle. 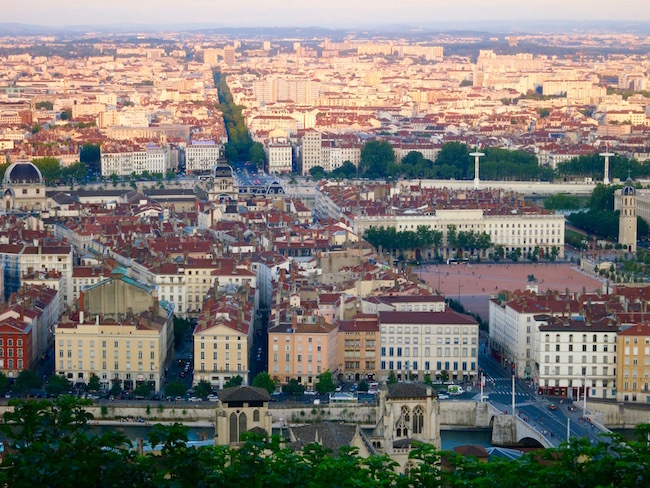 Traboule Tours: The City of Lyon offers two traboule walking tours, an Old Lyon Renaissance District and its Traboules Tour (12 Euros) and a Traboules of the Croix Rousse Hill and the Silk Printing Workshop Tour (10 Euros). Where do you catch the Lyon funicular? You can take the funicular up Fourvière Hill from Vieux Lyon Metro Station. 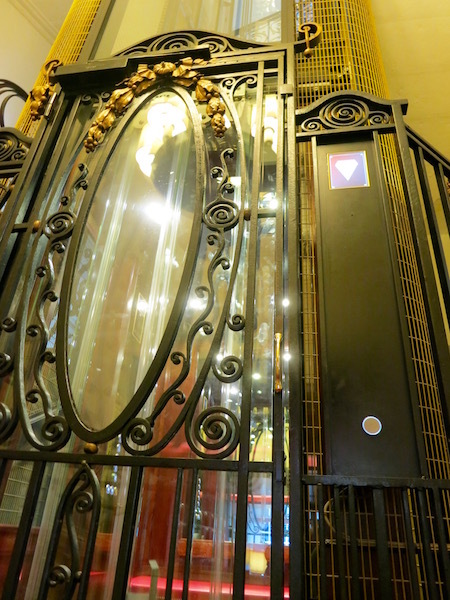 We stayed at the Hotel Carlton Lyon, which my husband adored because of its old-fashioned cage elevator and modern-meets-old-world-ish charm. I spent most of my time wishing I’d booked us into the Hotel le Royal Lyon instead, until we finally went there for a drink then I decided I preferred the Hotel Carlton after all. About the Hotel Carlton – Built in 1894, it’s centrally located between the Rhône and Saône rivers, near some good shopping areas. It’s quite elegant, with a Haussmann facade and forged iron balconies. Rooms start around $200. Location: 4 rue Jussieu 69002 – Lyon, France. Also looking very grand, and ideally located in Lyon’s Old Town (but out of our price range) was the Cour des Loges 2,4,6,8 rue du Boeuf, 69005, Lyon, France. Most tourists go to Lyon for the cuisine. If it’s food you’re after, visit my Restaurants in Lyon blog post. Canada to Lyon: With Lyon becoming the place to visit in France, kudos to Air Canada to start flying direct from Montreal 5 times a week. If you’re flying from Toronto you’ll have to change planes in Montreal. Flights start June 16, 2016, but you can book now. 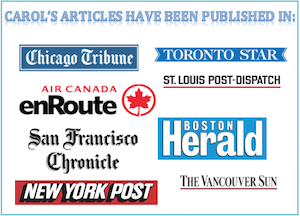 Visit the Air Canada website for prices and bookings. Paris to Lyon: You can get to Lyon in two hours by train from Paris. 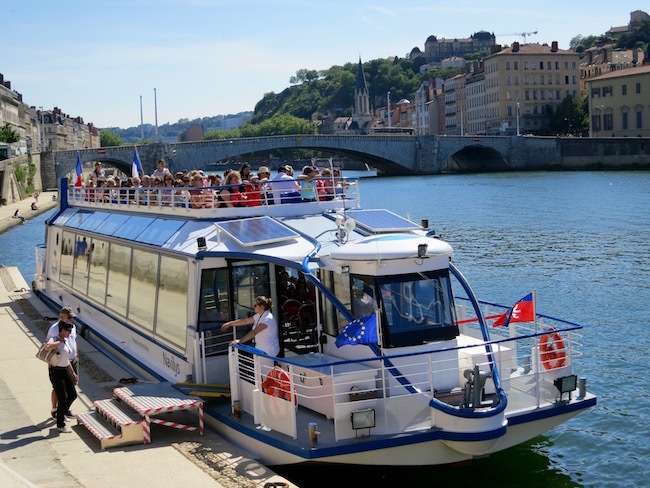 For more info on what to do in Lyon and where to go in France visit the France Tourism website Atout France, and Only Lyon, the city of Lyon’s website. For more places to visit in Europe visit my travel blog post Places in Europe You Should See. 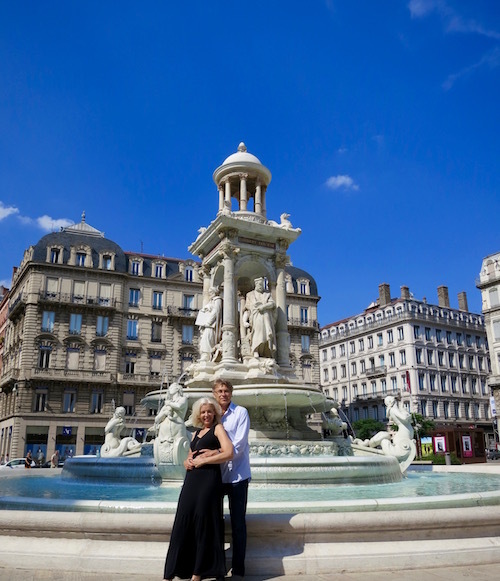 If you’re thinking of visiting the South of France read Things to do in the South of France or visit my France Travel category page. I wish I had read this before going to Lyon. Now I know I missed some interesting things. I did enjoy walking down the hill, though. I also thought the textile museum was amazing and I wouldn’t have thought of it had my savvy daughter not insisted. I guess I’ll just have to go again some time. The park is truly beautiful – and I love that there are secret passageways all over the city! It would be so much fun to explore! Lyon looks wonderful! While I’d definitely want to eat all the food, these are some great suggestions to check out! I would love to explore the traboules and the basilica looks gorgeous. Thanks for providing such a fun list of spots to check out! Don’t miss my food article on Lyon then, Drew. Then you’ll be covered all ways around! I haven’t yet been to Lyon but France is one of my favorite countries and I have yet to be disappointed by a less-than-amazing experience. Unfortunately, I almost always plan my trips around the food, so it’s a much lower priority to figure out what to do between meals and then I find myself wandering around not knowing how to spend loads of time! Cheers for your great tips! Going through Traboules definitely sounds like fun! I laughed at the what to do in Lyon that doesn’t involve eating. So hard but you made a good list. I love reading about your adventures traveling with hour husband. You both are too cute! And so you should, Tanj. Yes, traboules are fun indeed, Kathrin. Well I’m so glad you asked, Jackie. I assumed the one on the hill was American from her accent. She was with 2 men and talking loudly. (How many men she needed I have no idea.) The other women (hmph) I think were French. Lyon is definitely on my list of cities I want to see in France. I’ve only been to Paris so far, so there is still a lot more to explore. I’d love to go on a little tour and find all the traboules! That sounds like an interesting adventure. I have not been to Lyon but your post makes me want to go!